I am delighted with the result and look forward to spending many delightful hours weaving these colorful and unique style of belts. This is my first attempt at weaving with this loom. I decided to keep the pattern very simple at this stage, and to concentrate on getting my tension right. I found this weaving reed very easy to use. It is lightweight, easy to thread and very pretty to look at. The threads do not snag, as they did on the earlier wooden version that I had. 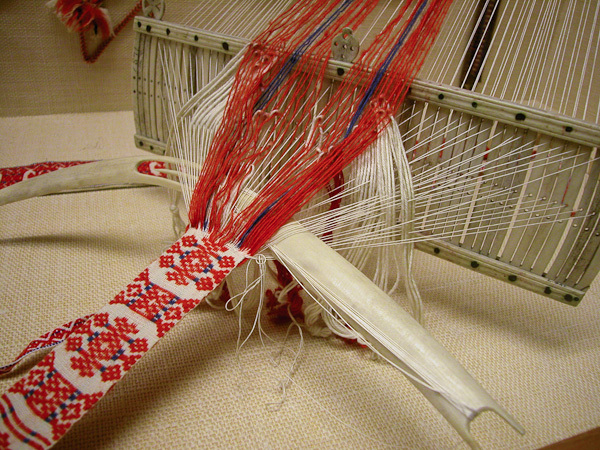 Weaving with a Double Slot weaving reed. When you push the heddle down, the pattern threads (Black) move into the middle of the heddle – the top warp threads of the ground warp are raised and the bottom warp threads are lowered. Hold the weaving reed in this lower position and put your hand into the raised shed, separate the threads and run your hand down to open the shed and beat down the previous row. The pattern threads (Black) are now in the center, in between the 2 ground warp threads. Pick up the pattern threads (Black) that are used in this row of the pattern and push down the other (Black) pattern threads. Leave all the other (red) top ground threads in your hand – as this weaves the tabby ground warp. Pass your weaving shuttle through this row. Lift up the weaving reed to change the shed. Put your hand into this shed and beat down the previous row and adjust the tension. The pattern threads (Black) will now be above both of the ground warp threads. While holding onto the raised ground warp and pattern warp threads, pick up the (Black) pattern threads according to the pattern draft, and allow the other (Black) pattern threads to drop – keeping all of the raised ground warp threads (Red) up, as this again weaves the tabby ground warp. Pass the weaving shuttle through this row. The Black pattern threads that you picked up will float above the warp. The Black pattern threads that you dropped will float on the underside of the warp, creating a mirror effect on the reverse of the cloth. Change sheds by dropping or pushing down the weaving reed. Again put your hand into the formed shed and beat down the previous row and adjust the tension. I thought I would experiment with adding a few beads to this woven band. I used seed beads and strung them onto a length of yarn, similar to the yarn I was using for the weft. I threaded this yarn through on a weft row and positioned the seed bead in between the warp threads and beat the weft into place, and wove the next weft row with the regular weft yarn I had been using. The loops of weft yarn will be sewn in and trimmed off during finishing. If you are looking for something new to add to your loom collection, why not add one of these from Stoorstalka? About Sami art and culture. Why not join the Yahoo group to learn more about weaving braids and bands? A6 Felted Journal Cover Reindeer Design on Etsy.